Royals Corner: KC Royals News, Updates and Information: RC Mailbag: Why did the Royals sell Carrasco to Japan? RC Mailbag: Why did the Royals sell Carrasco to Japan? While RC eagerly awaits news of which players have been removed from the Royals' 40-man roster to make room for new additions Reggie Sanders and Joe Mays, we decided to take some time to answer some burning questions on the minds of Royals fans. Keep those questions rolling in, folks. Hey RC, I was wondering why the Royals would sell their most reliable pitcher to Japan for a measley $100K. When the Royals have had so much trouble over the years developing starters, this move just doesn't make any sense! A pitcher with D.J. Carrasco's versatility was incredibly valuable to the team, and he'll be sorely missed. A: RC: Thanks for the question, Jim. Yours is a view that has been widely circulated in the media, by folks like Bill Heeter over at Kauffman Confidential and Jeffrey Flanagan at the KC Star. Needless to say, RC doesn't share that opinion. First, it's important to point out that while Carrasco's versatility has value, he's hardly a pitcher who will be sorely missed. He had a nice two-month stretch covering nine starts through May and June, during which time he pitched 55.2 innings with an ERA of 3.40. However, his peripherals -- particularly his miniscule strikeout rate and 1:1 K/BB ratio -- signaled that he was incredibly lucky during that time, and sure enough, the luck didn't last. The law of averages caught up to Carrasco, and from July through the end of the season, Carrasco posted a lousy 6.25 ERA in 59 innings, finishing the season with a 4.79 ERA. Carrasco pitched poorly enough that his place on the 2006 roster was in serious jeopardy, and on his performance alone, the Royals' decision to let him go to Japan is perfectly justifiable. However, we're convinced another factor was also at play in the decision. Sayonara, D.J., and good luck. Carrasco did everything the Royals ever asked of him, and the $100,000 KC received for a pitcher who's as reliably average and versatile as D.J. is not exactly a significant amount. Therefore, RC is convinced that the move was largely based neither on his performance nor the money the Royals received. Rather, it was a decision based on class. Frankly, it was a classy move to allow Carrasco to move on. It was, simply put, the right thing to do. D.J. 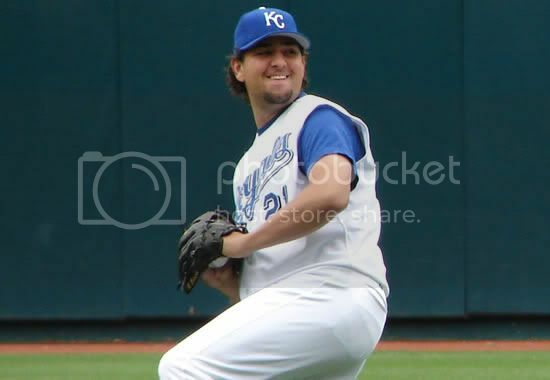 has made the league minimum throughout his career, and had he been lucky enough to even make the Royals 25-man roster in 2006 (which again was doubtful), he again would have only earned slightly more than the pro-rated league minimum. Meanwhile, the Japanese team that wanted him was offering a two-year guaranteed contract for $2.8 million. This is a great opportunity that gives Carrasco the ability to guarantee a lifetime of financial security for his family. Allard Baird couldn't even guarantee him a spot on the team. How can anyone expect the Royals to deny Carrasco -- a class act in his own right -- such a great opportunity, simply so they could have a little more depth in Omaha? Had Carrasco been a more important player to the franchise, we could see the wisdom behind refusing his departure. But as it stands, we're pleased and proud the Royals saw fit to give a perfectly replaceable player the opportunity to move on to a vastly better situation. This is nothing to complain about. I saw today that Preston Wilson was signed by the Houston Astros to a one-year, $4.5 million deal (including buyout). Meanwhile, the Royals go out and commit $10 million over two years for Reggie Sanders, who's no better than Wilson but is seven years older. How can you justify that? As you can see, once park factors have been weighted (through OPS+) Sanders has clearly been the superior offensive player over the past three years. In fact, if RC wasn't lazy, we'd expand our chart to show you that it's not just limited to that timeframe. For instance, Wilson's OPS+ of 115 in 2003 was his career high, while Sanders' average OPS+ over his 15-year career is 117. Simply put, Wilson's gaudy power numbers (if you can even call them that) are largely a result of playing the majority of the last three seasons in the thin air of Colorado, while Sanders has consistently put up above average offensive numbers playing the majority of his games in neutral or pitcher's parks. As far as we see it, Wilson holds only two advantages over Sanders: 1) He's seven years younger, and 2) he generally plays in about 10-15 more games per year. However, Sanders is still a superior player to Wilson in every facet of the game -- offense, defense, and speed -- and as we have repeatedly stated, he's shown no signs whatsoever of an imminent sharp decline. Would we rather pay Sanders $4.5 million for one season as opposed to $10 million for two? Absolutely. But that clearly wasn't an option. Furthermore, we have no idea how much it would have cost to put Wilson in a Royals uniform (it likely would have cost KC more than the perennially-competitive Astros), but we guarantee we'd have been far more disappointed with the contract he ultimately got than the one the Royals gave Sanders. While Sanders figures to be a marginally above-average offensive player in 2006, only a sucker would expect Wilson to put up anything more than league average production playing a full season in the spacious confines of Kauffman Stadium. Wilson might go on to hit 40 dingers this season for the Astros, but it will be entirely attributable to the fact that Minute Maid Park (which has a RHB-HR index of 133, meaning it's 33 percent easier for right handed batters to hit home runs there) favors right handed batters more than any other park in the National League, including Coors Field. RC is prepared to see Wilson put up some monster numbers in Houston, and we know it will spark even more protests from Royals fans, but the fact is that the Royals got the better player. RC, what's up with the hate you throw at my boy Aaron Guiel? Why must you refer to him as "AAAaron Guiel?" I know he's no Brad Wellman, but is he not a quality option for fourth outfielder? A: RC: It's not that we don't like Guiel...we do. In fact, prior to the 2004 season, RC seriously considered purchasing a Guiel jersey. And really, what's not to like about Guiel? He hustles, he plays quality Major League defense, and he's got a short, quick stroke that produces decent power when he's going right. Sure, he's a Canuck, but he's from western Canada, which is the cool part. And in the two seasons in which he could actually see, Guiel's done a fine job. Indeed, Guiel very well may be a quality fourth outfielder, and we expect he'll get a good chance to earn that role this spring. The "AAAA" label was really just a juvenile swipe at the folks who insist he's anything more than that. If there's one thing that annoys RC more than anything else, it's the folks who drone on and on about "intangibles," which inevitably results in orgasmic praise and disproportional recognition for players like Joe McEwing and Bo Hart, not to mention longer-than-deserved careers. Lots of guys play hard, but for some reason only a select few ever get that kind of canonization. Guiel is what he is: a big question mark with limited upside. He's got a great story, but great stories don't win ballgames. Neither did Brad Wellman (zing!). I read recently in the KC Star that the Royals are thinking about moving Denny Bautista to the bullpen. Don't we have enough power arms in the pen... why not put him in the minors and season him a bit? Not shift him to the bullpen. He has the potential to be a great starter not a decent reliever. A: RC: This is nothing new. Guy Hansen last season began hinting that Bautista's future may be in the bullpen, and we wouldn't be surprised if you see him making relief appearances early this season. Before getting upset about this, there are several things to consider. First, while Bautista has four pitches (fastball, slider, curve, and change) that could on any given day be above average, he's struggled to command them consistently throughout his career. If he learns to command even three of them, it's hard to imagine his move to the bullpen would be permanent. Second, Bautista still has to put some more weight on his 6-5 frame and improve his mechanics to become a guy who can reliably stay healthy enough to log significant innings. Shoulder problems are a pitcher's worst nightmare, and the Royals believe Bautista's injury last season came about from his inability to consistently repeat his delivery. Moving him to the bullpen may be a way to help limit his innings while allowing him to concentrate on improving his mechanics. Finally, keep in mind that Bautista is still only 23-years old, so there's plenty of time for him to become a quality starter. We share your concern, and we definitely prefer Bautista gets every chance to become a starter, but we just don't believe the Royals have yet given up on that idea. I could live with Bautista in the bullpen.... if it's part of an exchange program wherein Burgos becomes a starter. Bautista is 25 years old, 26 in August. I think he still should be given every chance to fail as a Starter before being moved to the 'pen. Agreed bda. The hard-throwing, young, potentially dominating starter is the possibly the most valuable commodity in all of sports. This situation has the makings of a Jeremy Affeldt - starter, hurt, starter entering ST, shifted to bullpen, back to Omaha to stretch out to start again, etc. etc. Send the kid Omaha to start. That should be the end of the discussion. Hmmm, Baseball America and the Baseball Cube have his birthday as 10/23/82, and I was going off of that. However, the Royals website and Baseball Reference have his b-day as 8/23/80. Was Bautista one of those guys who fudged his age? I don't remember hearing about that, but I'd assume the information on the Royals roster page is accurate. "This situation has the makings of a Jeremy Affeldt"
Wishful thinking, my friend. But then again, your optimism never takes a day off. Did the Twins convert Santana from starter to reliever when they plucked him in the Rule V or was he already a reliever (I can't remember)? Whatever the role, the guy needs to have a healthy 2006, lest he join the ranks of Jose Rosado, Chad Durbin, Miguel Asencio et al. I still hope he makes 20 starts in Omaha. Bautista will start in Omaha, barring a fantasic spring training. Baird has already made a project out of Mays - the starting rotation is set. Redman, Mays, Elarton, Greinke, Hernandez. They'll start Affeldt in the minors to build up his pitch count, when Mays implodes we'll bring him up to start. I can't see BAIRD doing it any other way. I don't think Affeldt can go to the minors -- I'm pretty sure he's out of options. Keep Bautista as a starter. This team shoots itself in the foot too much by failing to maximize the potential of its best talent (Andy Sisco, Jeremy Affeldt). Plus Bautista always struggled in the first inning of games - in relief, that may be the only inning he gets!